Who said you can’t have chocolate and peanut butter for breakfast? 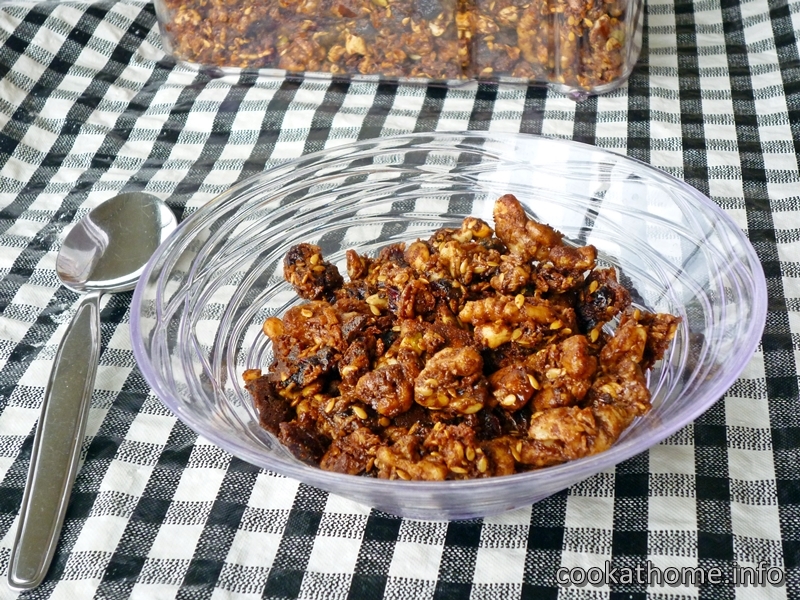 This granola is definitely a winner in my books! I love granola. I think I’ve either started off every granola post with those three words, or I have them somewhere in the text. Because, it’s yummy. And a great breakfast for me (and Grant, when I let him have some!). Anyway, this is a granola that I’ve been playing with for a while, and I finally decided to post the recipe. 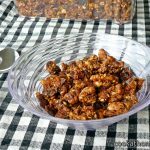 Because I want to share this awesome chocolate peanut butter granola recipe with you … so you can share the awesomeness! Most of the granola recipes that I make (when I’m not just throwing things from open jars and bags in the pantry together and calling it granola … ) generally start off with a nut butter (usually peanut butter) and a sweetener (either honey or maple syrup). So I thought, why not putting some cocoa powder in the mix as well? And maybe use some coconut oil to make it taste more coconut-y … is that a word? This granola still packs a punch for taste and flavor, and it’s still crunchy, with chunks of fruit, nuts and seeds in each mouthful. And as always, you can substitute for whatever you have in the cupboard. Just make sure you keep the ratio of fats (nut butter and coconut oil) and sweetener about these levels. And let me know how you go! Mix together the peanut butter, coconut oil, honey and cocoa until well combined. Add in the vanilla and cinnamon and mix well. Add in the seeds, nuts, cranberries and coconut and combine. The mixture will be quite stiff, but ensure all are mixed together. Spread into a shallow layer on the baking tray and bake for 15 minutes. Allow to cool before transferring to a storage container. Keep in a cool area in a sealed container for up to 7 days.